The Panasonic PK-750 camcorder was carried by Ray Stantz during the initial investigation of the New York Public Library in the first film. 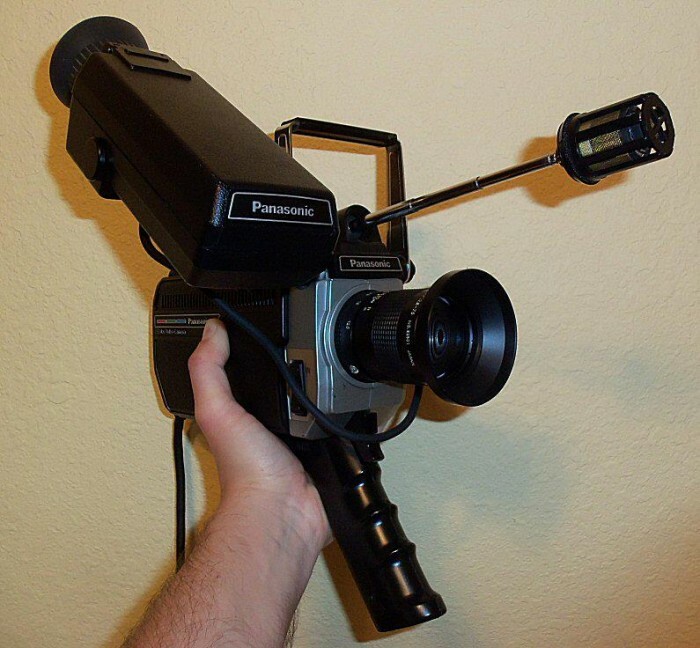 This was the camera for which Ray had ordered a new UV [ultra-violet] lens and required a videotape that Venkman had erased, and was the camera with which their first encounter with 'ectoplasmic residue' was filmed. 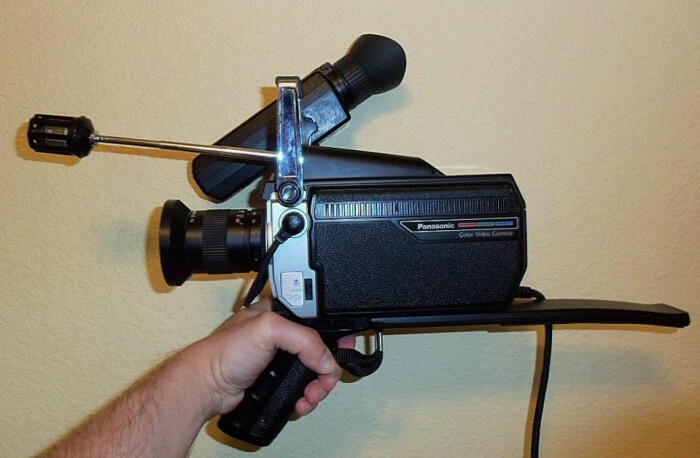 This type of camera did not actually record the image, and had to be connected via cable to a separate portable VCR, which was slung off the opposite shoulder in a carrying case. The most film-accurate VCR seems to be not a Panasonic product, but a Quasar unit, possibly a VH5300SE or a VP5410TE, which are very similar aside from minor variation in the placement of buttons. 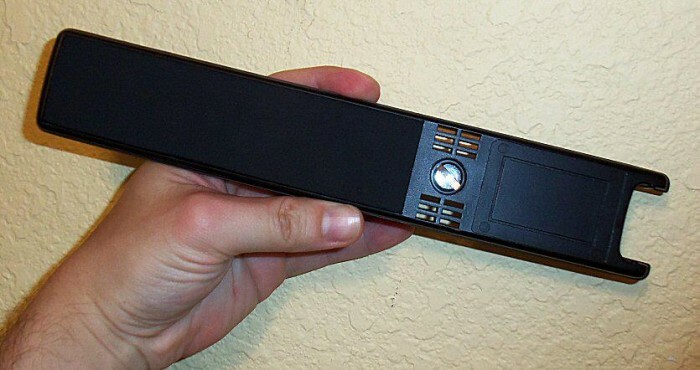 In some shots of the portable VCR in the film, the top-loading slot for a tape appears to be empty, with the record heads visible. No doubt Venkman's fault. When Ray switches to shooting still photos, Egon (Harold Ramis) briefly operates the PK-750 while Venkman is talking to the Librarian Ghost. Bill Murray can also be seen holding this model of camera in the television commercial which the Ghostbusters film to advertise their new business. Although he holds it in his right hand, the PK-750's electronic viewfinder is configured for left-handed filming. When Dean Yeager is kicking the trio off campus, one of the university workmen can be seen taking the PK-750 and the portable VCR away from Dan Aykroyd, which raises the question of how they got it back for the commercial. One feature of the PK-750 is a removable 'shoulder pad', reminiscent of the stock on a rifle, which the operating instructions say "is useful while recording without a tripod". 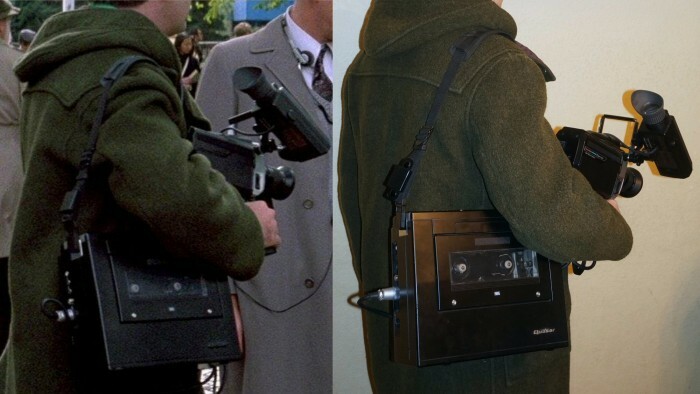 When Ray is upstairs at the Library, and when Venkman is outside for the commercial (both scenes shot in the initial location shoot in New York), the prop has the shoulder pad attached. When they go downstairs to the stacks, filmed in LA, the shoulder pad has been removed. Yet when they exit the library in a panic, previously filmed in NY, the shoulder pad reappears. The photos used here are of a PK-750 (and VH5300SE) in the collection of Alex Newborn. It is missing a windscreen for the microphone, which is common due to deterioration of the foam over time.